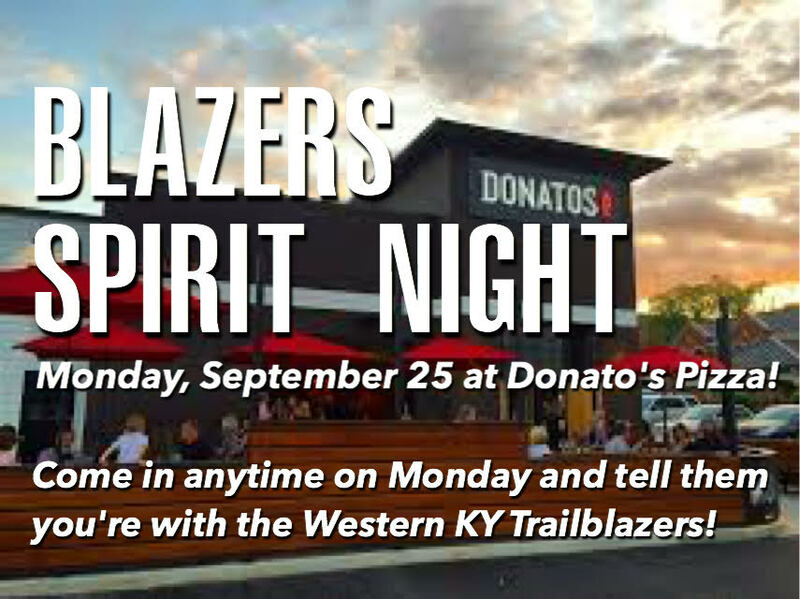 The Trailblazers Kickoff Event is coming October 24th, 6:30-8:30. All current Trailblazers are invited. We will have Chick-Fil-A ($5 per meal, please RSVP to 270-943-0434 if you have not already done so). Players will scrimmage in exposition and we will introduce all the players. Here is a summary of some of the things discussed at the parent meeting on Monday 8/28. We heard a briefing from the coaches who were able to be there. Most emphasized the need for consistency in attending practice, increasing the commitment level of players/parents, and explained the practice schedule as well as some tournament opportunities. We reviewed all the registration paperwork forms. Before your player can practice, we must have six things. Essentially, registration is due on or before your first practice day or 9/15 whichever comes first. 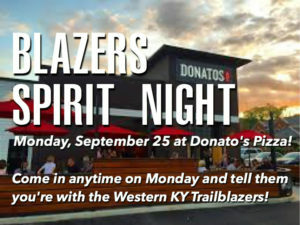 You can fill out the registration form online at WKYTrailblazers.com. Turn all other paperwork in to coach or team mom. Payment can be made by check and handed in with paperwork or online via PayPal. We discussed Fundraising for the 2017-2018 season. Unfortunately, we do not have anyone overseeing fundraising as a whole. This is a big void – so if you are one of those organized, go get ‘em kind of people, we would love to have you step up to the plate. Contact anyone on the committee. Due to our lack of someone overseeing fundraising, a few incorrect comments were made. Let this be a clarification. 1) Each single player family is required to pay a minimum of $150 in fundraising fees. Each two or more player family is required to pay a minimum of $300 in fundraising fees. 2) We encourage everyone to contact businesses within their sphere of influence and request a $300 donation for an advertising spot to be displayed at our home games. Last year, this covered a huge portion of the entry fees for “extra opportunities” namely tournaments. A $300 donation will earn $50 toward fundraising fees (this was kicked around a bit at the meeting, but we did end up stating it this way in the end). 4) We will be hope to be hosting a tournament for our 12Boys team this season. These dates were discussed in the meeting, but may change. We will notify everyone as soon as we confirm the dates. Please mark the dates (Veterans Day weekend 11/10 and 11/11). This has the possibility of being a good fundraiser but it will take everyone’s help. Even if you do not have a 12B player, you are expected to help with this tournament. 5) You may coordinate your own fundraising opportunities such as car washes, bake sales, donut sales, etc. These can be done on your own or in coordination with a handful of other families of your choosing. If you are setting it up, you decide who to invite to join you. We discussed a change coming NEXT year (2018-2019). At the end of this year, players will keep their uniforms. Starting next year, there will be a separate uniform fee in addition to registration. Players who still have their uniforms can use them again. Players who have lost or outgrown their uniform will purchase the pieces needed. Obviously, players new to the program will need to order the full uniform set. You may also pass uniforms down to younger siblings. Please note, that it is possible that the company will discontinue the uniform style at some time in the future – at which point everyone will need to purchase new uniforms. We discussed that all information about scheduling is already on the calendar at WKYTrailblazers.com. Check it out. We also posted the websites for “Nationals” and “MTAC” please check those websites out as well, particularly the eligibility sections if you are new to our program or have never read the MTAC by-laws before. Mary completed the evening explaining the volunteer needs. Everyone will be assigned some tasks at almost every home game. These things include Set up, Admissions, Concessions, Bookkeeping, Scoreboard operating, and Cleaning. In addition to those recurring needs, there are many other things that go into a successful season. We will need everyone pitching in (and some in more than one capacity). If any of these pique your interest, please contact Mary. Several jobs were filled at the conclusion of the meeting. These are the remaining tasks available. 4) If you have a good camera for action shots, please let us know and we will assign you a game or two to cover. 5) Other needs may arise during the season. If you notice something that needs to be addressed, please let us know. 6) Fundraising coordinator would be a tremendous help. We definitely need someone to coordinate logos and signage as well as track smartcards and fees for each family. This could be split between 2-3 people as well.